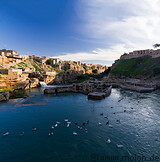 Shushtar is an ancient fortress city in the Khuzestan plains, 80km north of Ahvaz, not far from the Zagros mountains. The highlight of Shushtar is the historical hydraulic irrigation system, which was built by Roman prisoners in the third century BC. 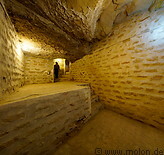 This consists of a series of water channels dug into the rock and water mills. The complex allowed the controlled distribution of water across the plains. The hydraulic irrigation system has been a UNESCO World Heritage site since 2009.